With their children and grandchildren, the Fergusons and the Politos purchased newly built homes in Fairview, along I-40 in the most rural part of Williamson County. Fairview is just one of the long-overlooked places that are suddenly attracting attention from homebuilders and buyers alike. Anyone searching for new homes in the Nashville area will no doubt become familiar with Antioch, Cane Ridge, Old Hickory, Whites Creek and Wedgewood-Houston. “There’s not a lot in Fairview, but it’s 30 minutes to Cool Springs, 30 minutes to downtown Nashville. To someone from L.A., 30 minutes is nothing,” Ferguson says. He and wife Suzanne own a 3,650-square-foot house on a .75-acre lot in the Heartland Reserve subdivision. Their daughter and grandchildren live across the street. “We bought two houses for less than we sold our house for in California,” adds Ferguson, who says he believes his house would cost $300,000 more in Franklin. “For $300,000, I’ll drive 30 minutes,” he adds. Mike Polito, wife Kim and their daughter live down the street. 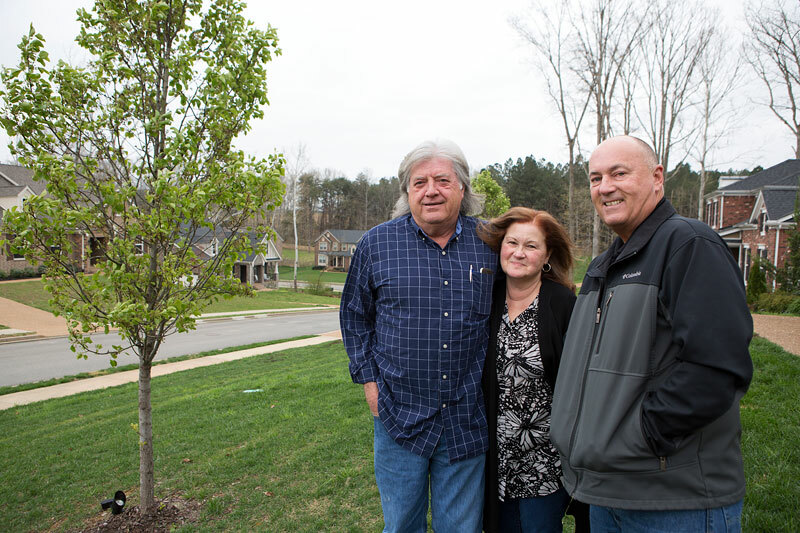 They bought their house after visiting the Ferguson’s, whose yard backs up to farm land. “Kim was looking out the window at the cow pasture. She said, ‘I could do this,’” Polito recalls. The Jones Co., the company that built their houses, is sold out in Heartland Reserve and is looking for more opportunities in Fairview, says Jen Lucy, the company’s director of sales. 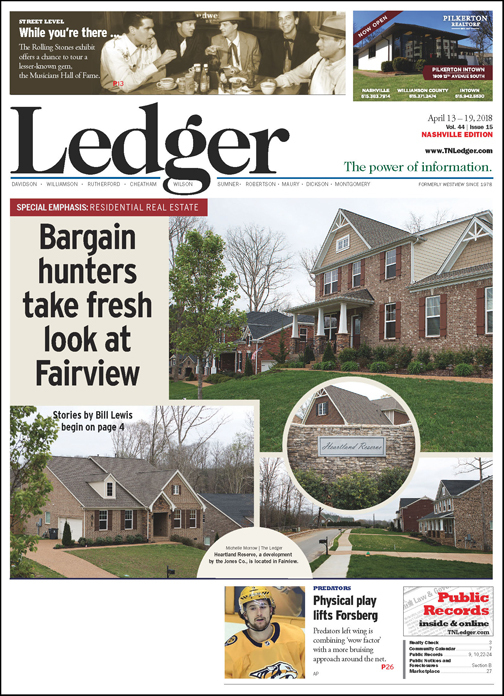 Fairview’s prices are lower than other places in Williamson County, “and it is also a quick drive to Nashville down I-40,” she notes. 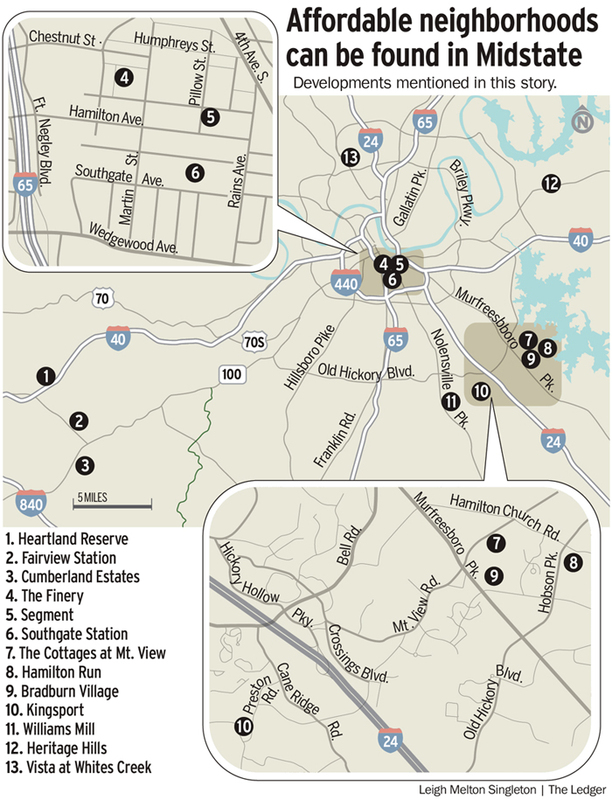 In Fairview’s Cumberland Estates subdivision, new home prices start in the mid-$200,000s. The neighborhood will have 200 homes when construction is finished. “Sales have been brisk,” says Trey Lewis, vice president for Ole South, the company developing Cumberland Estates. Larry and Suzanne Ferguson, left, with fellow California expat Mike Polito outside the Ferguson’s home in Fairview. The Fergusons and the Politos were surprised to find out how far their money could go in Fairview, especially when compared to California real estate. “A lot of expansion to Fairview is coming from western Davidson County, people looking for a quality of life they can afford,” he says. Bruce McNeilage has a solution for people who want a new, single-family home in Fairview but don’t want the expense of buying a house. He is developing an entire subdivision of rental houses. Fairview Station is located off Tiger Trail and is adjacent to Westview Elementary School in Fairview. It will have 25 homes. Brandon Robertson is the builder. McNeilage, a principal with Kinloch Partners, previously built Solo East, an affordably priced condo development in East Nashville. “We’re renting them as fast as we can build them,” McNeilage acknowledges. Fairview is closer to downtown than another growth hot spot, Spring Hill and points south in Maury County, he says. “The old reputation of (Fairview) being too far out of town is actually a misnomer now with Spring Hill growing in Maury County,” McNeilage explains. Known as WeHo, Wedgewood Houston is becoming one of Nashville’s fastest-evolving neighborhoods. The formerly industrial neighborhood is located two miles south of downtown between Fourth and Eighth avenues. The Fairgrounds, where the city’s new multi-million-dollar soccer stadium is to be built, is nearby. Core Development and its sister company, Village Real Estate, are developing the Finery, which will have 490 residences and 80,000 square feet of commercial space, including Corsair Distillery and Diskin Cider. Segment, a 34-residence development by Core, is at the intersection of Pillow Street and Merritt Avenue. Prices start in the mid-$200,000s. On Southgate Avenue, Landmark Homes and Advent Partners are developing Southgate Station, with 23 flats, 13 townhomes and 11 single-family houses. Prices range from the upper $100,000s to the high $700,000s. Parks real estate company is handling sales. Because of its industrial heritage, Wedgewood-Houston continues to appeal to “makers” like Corsair and Diskin, says Mark Deutschmann, a founder of Core. At least 175,000 square feet of commercial space is being developed in the former May Hosiery Mill. Carbine & Associates, a custom home builder based in Williamson County, is building several homes in WeHo. “We mainly build in Williamson County, but the market was so hot,” in WeHo, says Kristen Carbine, of Carbine & Associates and a Realtor with The Bodden Sisters - EXIT Realty Music City. Carbine & Associates has completed the sale of two duplex units, which were listed for $515,000. The company received full price offers for two residences on Stewart Place, which are under contract for $549,000 apiece. One was purchased by an investor. The other was bought by an owner moving from 12 South, another hot in-town neighborhood. Carbine says the company expects to build more homes in WeHo. “I can see it being the next 12 South area,” she points out. Located on the southeast side of Nashville, Antioch is home to the region’s first large all-rental subdivision, the Cottages at Mt. View. The neighborhood, on Mt. View Road, has 253 single-family homes. It also has townhomes with two master bedrooms that are designed for roommates. The neighborhood was developed by HND, which is also building 42 townhomes in nearby Hamilton Run, located at Hobson Pike and Hamilton Church Road. Prices start in the low $200,000s. Ole South will build 100 single-family homes in Hamilton Run priced from the low to mid-$200,000s. Not far away, next door to the Publix grocery on Murfreesboro Road, Ole South is preparing to begin construction of Bradburn Village, which will have 132 townhomes when completed. Thirty-six are planned for the first phase. Prices start in the $180,000s for a townhome with appliances, granite in the kitchen and engineered wood floors. Ole South Vice President Trey Lewis describes both developments as workforce housing priced within reach of teachers, nurses and others. “Workforce housing is needed, and Ole South is the leading provider,” he adds. In Cane Ridge, which could be described as a suburb of Antioch, Goodall Homes developed Kingsport, a neighborhood of 69 single-family houses, on Lightwood Drive. Prices range from $247,000 to $297,000. Homes range from 1,753 to 2,450 square feet. On nearby Holt Road, the company is planning Williams Mill, an active adult community reserved for buyers 55 and older. On the east side of Nashville in Hermitage, Ole South is selling homes in the new Heritage Hills subdivision, located along Lebanon Road on the Wilson County line. Prices begin in the $230,000s. Homes have two-car garages and all appliances. The first phase will have 76 houses. “We’ve already sold over 40 and we haven’t even opened the model home. We projected that for the whole year,” Lewis explains. In Whites Creek on the city’s north side, all of the homes in Ole South’s Vista subdivision were quickly snapped up. “Everywhere, workforce housing is being swallowed up,” Lewis adds.